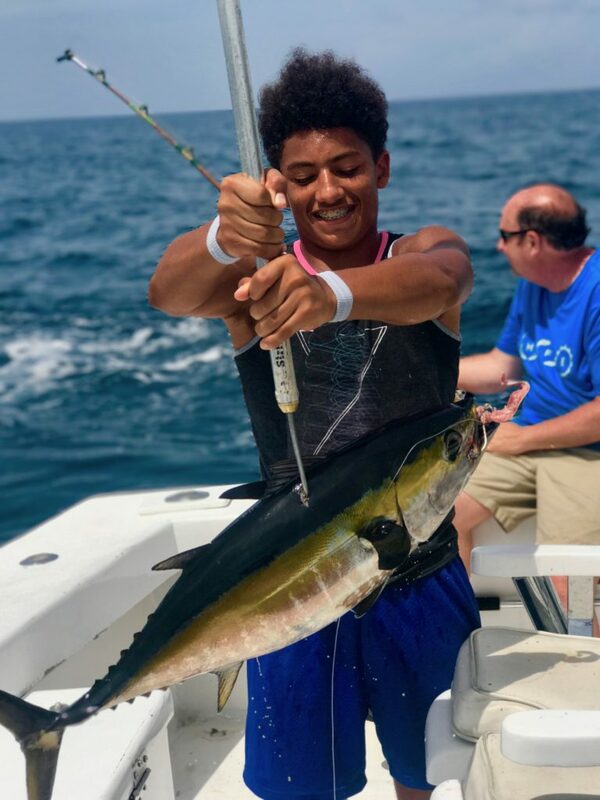 The reef action lights up this month with lots of bonitos, kingfish, barracuda and blackfin tunas biting. We’re catching them trolling, the best technique of sportfishing during the summer months. Trolling is a technique of dragging lures and rigged baits, up and down the reefs and along the edge of the Gulfstream to try to catch whatever we come across. Its the best technique in the summer months because the fish are all scattered over the reefs and moving around, so it takes some traveling and looking around for them to find ’em. Action in the summer is great. While you are trolling, you will periodically hit little flurries of action on bonitos, kingfish, blackfin tunas. Sometimes a big barracuda, wahoo or even sailfish jumps on the line. You never know what you might catch when you are trolling. Nice blackfin tuna just gaffed and brought into the boat on our deep sea fishing charter. Drift fishing is awesome in the summers months. On our day trips, we’re drifting over the reefs so you can bottom fish with a chicken rig or fish for muttons with a longer leader. On the day trips you can also float a kingfish line out there in hopes of a big kingfish bite. You never know what you’ll catch drift fishing in the summertime. June is a month for mutton snappers, big mangroves, kingfish and red groupers. Night fishing is just as good. Snappers are biting really good. June is the mangrove snapper spawn. They bite really good at night, sometime off-the-scale-good. Mangroves usually have a few nights in the summer when they snap! They do their annual spawning along the reefs, and then throw caution to the wind and eat everything they come across. It’s a great snapper fishing event and we have some epic snapper catches this month on our night anchor fishing trips. 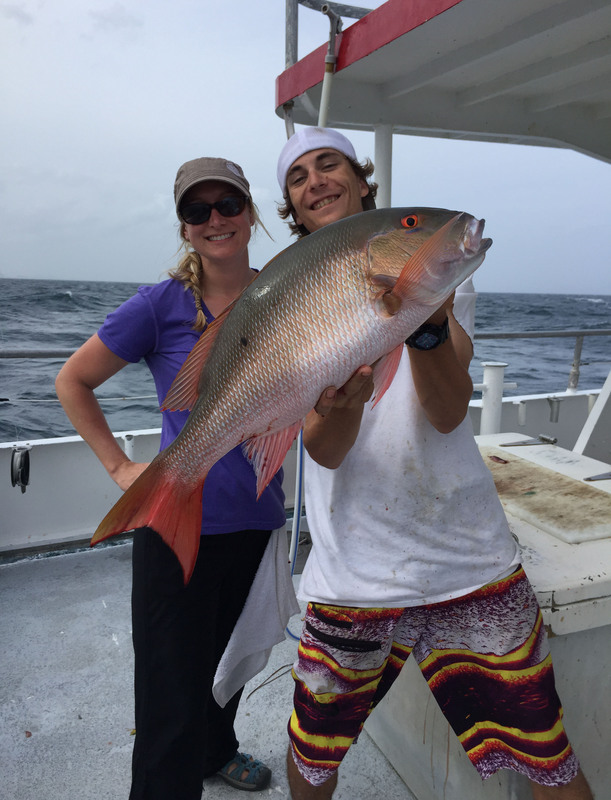 Nice mutton snapper caught on our deep sea drift fishing trip by this fisher gal. Wreck fishing is quite good in the early part of the summer. The amberjacks from the Spring months were late this year and are still biting strong on most of the wrecks over 200ft of water. Almaco jacks too are biting very good. Groupers are a bit more elusive but they are there if you fish for them. I like to fish a bit deeper for grouper 300+ feet of water for the snowy groupers. We’re catching them on some of the deep wrecks and on an all day private charter, we can load up on the snowys going from wreck to wreck until we find them biting. Vermillion snappers are biting too, but with all the action on the reefs, we haven’t been fishing for them much. 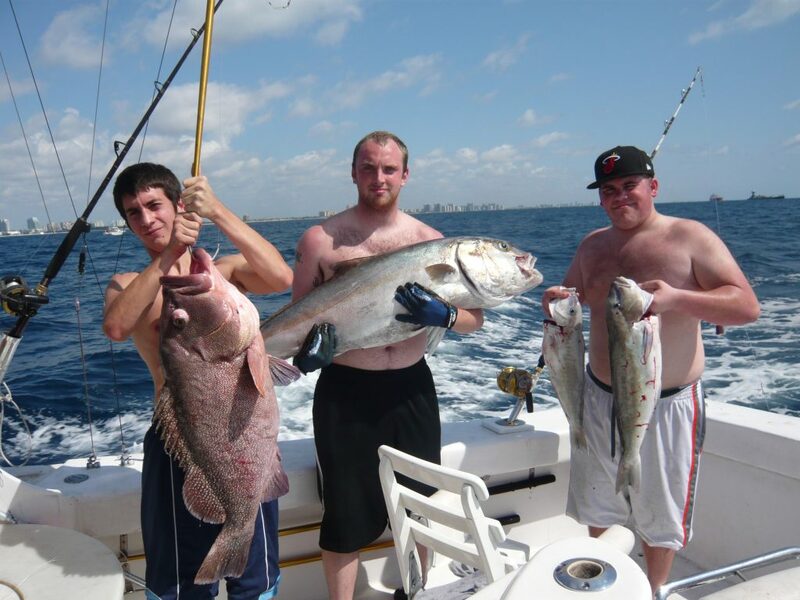 Offshore fishing in Fort Lauderdale is more hit or miss. Outside of 350ft of water, the continental shelf starts to really slope off. It gets deep very quickly. 2 miles offshore, you are in over 600 feet of water. Out there in these depths, there are only 2 main targets: mahi-mahi dolphin and swordfish. Both require really long trips to target because of the time requirement. For dolphin, you need to cover some ground out there, the more nautical miles the better. Every mile of territory you troll over increases your chances of finding dolphin. Some days you find them in the first 15 minutes. Much more often, it will be hours and hours before you find your first fish. The good thing about dolphin is that they are gregarious. If you find one, you are likely to find a whole school of them out there, sometimes enough to load your entire fish box in shot. My dad always described dolphin fishing as, “hours and hours of boredom, interrupted by a moment of panic”. It is really exciting when you do find the dolphin out there and your effort that you did to find them pays off. 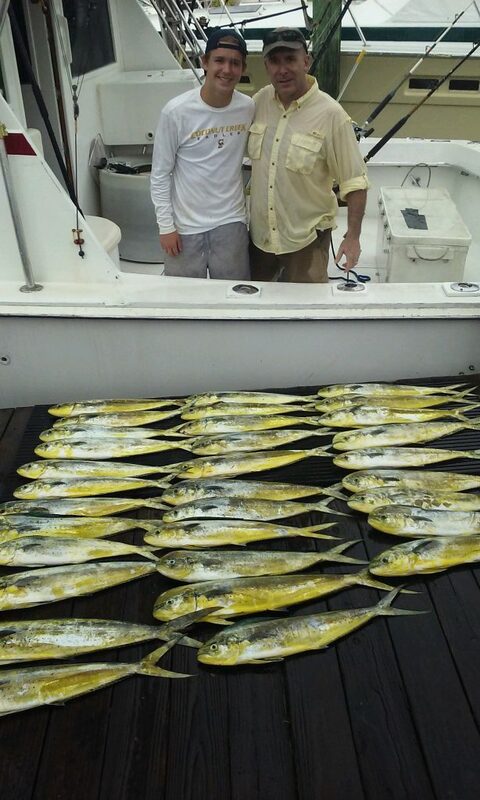 Great catch of mahi-mahi on our sportfishing charter on Father’s Day weekend. Swordfish requires it’s own trip. You have to go even further offshore, about 15 miles offshore to get to swordfishing territory. There are 2 ways to fish swordfish. You can daytime deep drop for them or you can night drift for them. Night drift is nice because you can use hand crank rods and put 4-5 lines out as you are fishing near the surface. Daytime deep dropping only allows you to fish one line at a time and it must be an electric reel because of the extreme depths out there. Check out our YouTube channel (and subscribe!) to see the cool swordfish video I just posted. Swordfish are truly epic fish, both a world class trophy gamefish and a great eating fish as well. And they get to be very large. If you are interested in a swordfish charter, the summer months are excellent for swordfishing. 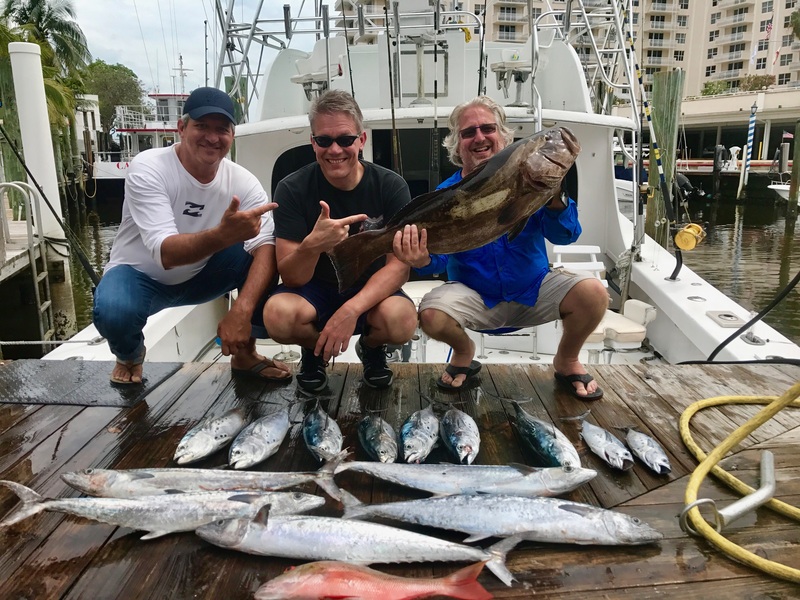 It should continue to be some great fishing this month for both our drift fishing and our sportfishing charters. There’s lots of action to be had, you just have to go out and wet a line. Good luck to everyone fishing with us. I’ll sea ya on the water. 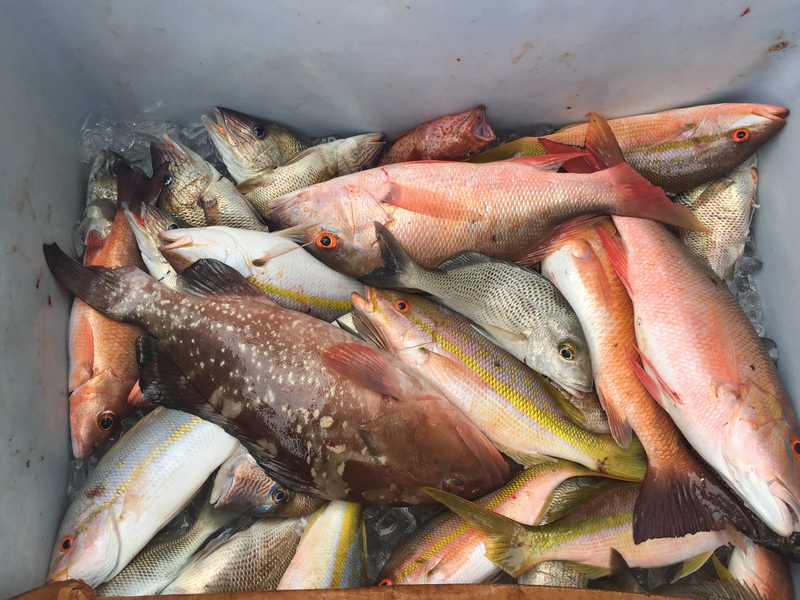 Nice pile of fish in the fish box during our Ft Lauderdale drift fishing trip. 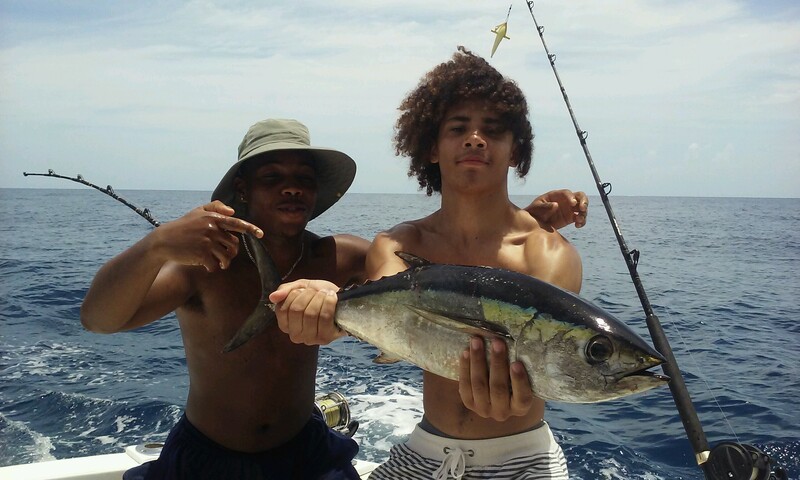 Nice tuna caught on our sportfishing charter out of Fort Lauderdale. 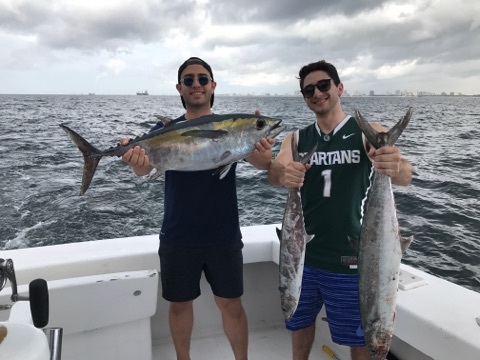 A nice tuna and a couple kingfish caught on our sportfishing charter. 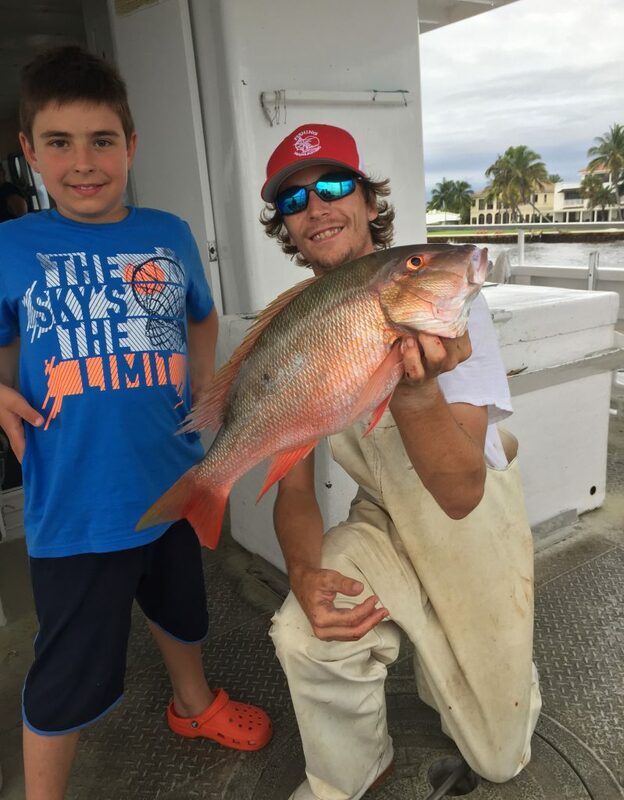 Nice mutton snapper caught by this fisher kid on a drift fishing trip out of Fort Lauderdale.